Off-road performance has just received an upgrade - with the 2019 F-150 Raptor promising custom power-bands on every hillside. Conquer the miles, Alberta, with help from the new Trail Control system. According to AutoBlog, the 2019 Raptor proves more than a mere powerhouse. Instead its 450 HP is eclipsed by class-leading precision. Engage the Trail Control system when facing any incline. This console allows users to regulate the truck’s speed - selecting a custom MPH ratio between 1 and 20. The performance-band is tightened, with all sequences slowed to accommodate this change in traction; and torque is seamlessly distributed among the wheels to improve connectivity. This allows the Raptor to better grip the ground - maneuvering steadily across even the rockiest terrain. The Trail Control system provides drivers with greater confidence, optimizing the four-wheel chassis and creating a smooth acceleration pattern. Once the incline has been traversed a simple push of a button will disengage the function and restore power to its previous levels. Trail Control will redefine backroad adventures for every Ford fan. To learn more about this technology - or to request a test-drive in one of our current F-150 models - contact us today. Across North America half-ton fans are staring toward the horizon - searching for the first hint of hybrid performance. Ford, they know, will soon unveil its EV-inspired F-150; and anticipation and anxiety battle for supremacy. What will this new pick-up offer? Will it prove a viable option for the commercial market? Details remain - frustratingly - scarce about the new F-150; but the Novlan team is thrilled to share few specs we’ve gleaned. We hope they’ll satisfy our customers’ curiosity… for now. The F-150 Hybrid should arrive by 2020. Production is expected to begin in the late spring, with a full North American debut scheduled for the early fall. Despite its hybrid label, this F-Series model will still boast aluminum paneling - with Ford determined to maintain class-leading strength. The material will be infused with steel beams to promote durability (and its lightweight design will further reduce engine strain, shedding up to 500 pounds from the chassis). While the F-150 will feature a series of external ports, it will not be classified as an EV. These outlets won’t be for plug-in connections but will instead serve as convenient options for powering tools, tablets, and other work items. What do you think, Alberta? Do these details impress? Share your opinions with us today! 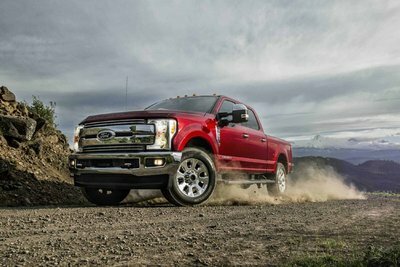 The half-ton market will soon change - with Ford partnering with aftermarket titan, ROUSH, for a new F-150. Prepare, North America, for the arrival of the 2018 SC! According to Kelley Blue Book, the SC is a monstrous platform - with a 5.0L V8 growling beneath its hood. Ably assisted by a ROUSH supercharger, this engine yields an impressive 650 HP and 610 lb.-ft of torque: dwarfing its predecessor's metrics by nearly 10%. A FOX Racing suspension anchors the chassis, promising coil-spring capability with every turn of the track; and a dual-tip exhaust system ensures optimal intake levels. Fender flares deflect debris, looming over the revised grille; and 20-inch all-season wheels rip through dust and snow alike. The KBB team reports that this F-150 variant also features a two-inch body lift - affording a muscular stance of 80-inches in height and 86.3-inches in width. This ensures effortless all-terrain handling, with the undercarriage better protected from brambles, brush, and more. Mickey Thompson Baja tires and shock guards further impress on the backroads. 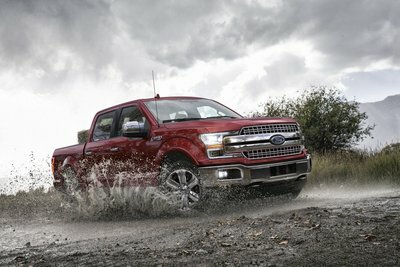 The 2018 F-150 SC proves a dynamic force in Alberta. To learn more about this platform - as well as other Ford aftermarket models - contact our team today. The terrain proves unforgiving - a collection of unsteady miles and hazy horizons. You grit your teeth, wanting to push past the chaos; but, with every press of the pedal, you can feel a car shake. Each rev leaves it struggling, and you worry that the engine will soon sputter out. May we suggest finding the quickest possible detour and heading to our lot? We have a half-ton upgrade waiting for you. Visit our dealership and discover the 2018 F-150 Lariat. This class-leading beast delivers exceptional capability, emphasizing all-terrain power with every mile. Anchoring its chassis is an independent suspension, which blends a coil-spring frontal design with a two-stage variable rear. This yields nimble handling, automatically adjusting the platform’s pitch and roll-rates to maintain stability; while an available electronic differential further enhances performance by engaging the back axle to propel traction. A fully-boxed frame ensures balanced weight distribution, and a two-speed automatic AWD increases grippage (seamlessly identifying the best drive-mode for each environment and allocating torque between the wheels accordingly). Take the 2018 F-150 Lariat on every backroad - trusting its 18-inch aluminum-alloy rims to shred the pavement. These standard features boast rugged milled textures and all-season treads, allowing drivers to glide across dust, shale, and more. 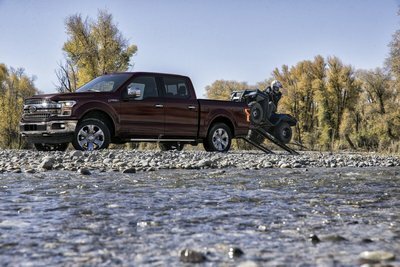 Want to test-out the Lariat’s off-road capabilities? Visit our dealership today! Prepare, Alberta, for a hybrid unlike any other - a chimera creature, fused from F-Series strength and Harley Davidson style. The 2019 F-150 Fat Boy is coming… and it will leave the pick-up market forever changed. According to Maxim, Ford is bringing new power to the highway. The 2019 Fat Boy (named for Harley’s famed bike) will bridge the gap between utility and design. 22-inch wheels deliver milled textures and all-season treading, allowing the truck to roll effortlessly over any challenge; while a bright-polished Flowmaster exhaust system frames the rear to provide maximum intake control. A BDS suspension lift yields up to three extra inches of height, protecting the undercarriage from debris (while simultaneously drawing attention to the chiseled side panels); and custom metallic badges flank the fenders and tail-gate, perfectly complementing the integrated LED running lights and halogen headlamps. Every angle of the Fat Boy is intended to impress - with even the hood carefully tailored. Ford has sculpted each line to counter engine strain, with a distinctive scooped shape routing cool air to the block. This optimizes temperatures while conquering inclines. It also, critics note, provides a sleek profile. The 2019 F-150 Fat Boy is the ultimate half-ton hybrid. To learn more about this platform contact our team today! Searching for a used pick-up? The Kelley Blue Book team suggests the F-150 - recently pitting the 2015 model against top-ranked competitors. In a grueling comparison of strength, this Ford platform proved to be the ultimate half-ton option for drivers: delivering class-leading towing and payload capabilities. We, of course, already knew this. According to KBB, the 2015 F-150 delivers long-lasting value. When placed in a hood-to-hood competition with the Dodge Ram, this platform proved superior - with its standard 3.5L V6 yielding 282 HP (6,250 RPMs) and 253 lb.-ft of torque (at 4,250 RPMs). Variable camshaft timing assures an impressive power-band, blending optimal air and fuel intakes; while the aluminum block boasts natural aspiration technology. A six-speed automatic transmission bolsters each response; and an integrated Tow/Haul function is essential on long-haul journeys, offering increased traction distribution to promote a steady ride. 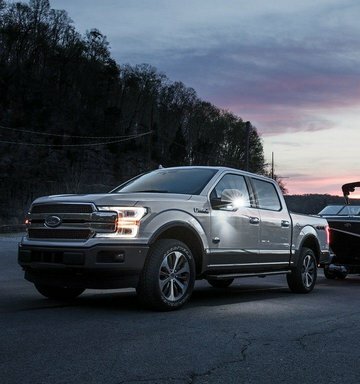 When these technologies combine, they provide segment-leading performance - with the 2015 F-150 delivering 7,600 trailering pounds and 1,910 payload pounds. The Ram, comparatively, offers only 4,460 trailering pounds and 1,880 payload pounds. To learn more about the 2015 F-150 - or to schedule a test-drive in one of our available Ford pick-ups - contact our team today! Upgrade your half-ton experience - taking advantage of Ford’s exclusive Equipment Package. This advanced suite allows for custom performance, letting drivers piece together the ultimate pick-up options for their off-road needs. Fuse the power side-view mirrors with LED spotlights, allowing for superior nighttime visibility. Step bars let drivers scale the Lariat’s massive frame (251-inches long, 86-inches wide, and 79-inches high) with ease; while chrome trim showcases the sculpted fenders and crisp panels. Blind spot sensors can also be integrated into the fascia, delivering radar precision with every mile. Pair the 2018 F-150 Lariat with real-time navigation software, taking advantage of GPS tracking and 3D mapping to ensure peerless route planning. 10-way power adjusters promote an ergonomic ride, pairing with available heating and cooling functions (these transform leather seats into temperature-controlled comforts); while HD Radio bolsters every signal. The steering column features tilting/telescoping functionality to provide a custom alignment; and the B&O Play radio yields cabin-shaking Bluetooth streaming. With the inclusion of the Equipment Package, drivers can turn their Lariats into masterpieces. To learn more contact us today! Perfection proves difficult to achieve - with the roads riddled with sharp hills and unsteady turns, the countless rumbling potholes. You try to navigate them all, but even your best efforts yield only tenuous results. There are simply too many challenges on your commute. Allow Ford to help you battle them all. According to Hot Cars, the 2018 F-150 is ready for every road - offering an advanced suite of assistance features to amplify your efforts. Cruise control utilizes radar sensors to regulate both acceleration and forward-distance planning, keeping the truck perfectly aligned on the highway; while hill descent software delivers bursts of torque as needed, identifying sudden declines and enhancing tread performance to create a smooth roll. Curve technology counters under-steerage, seamlessly adjusting the suspension to improve handling; and a blind spot detection function warns of approaching obstacles, releasing both audio and visual cues to afford operators enough time to respond. To further enhance performance, the 2018 F-150 also features lane-keeping technology. This uses intuitive scanners to observe the truck’s current road position (judging both pitch and passing markers). If drifting is detected, a series of beeps will sound - ensuring that drivers can quickly correct their trajectories and avoid an oncoming crash. The 2018 F-150 enables commuters to better respond to the road - emphasizing smart mobility with every mile. To learn more contact our team today! Does performance ever prove economical? Drivers know this sad answer - no. With every supercharged platform comes a loss of both fuel and dollars, with robust engines demanding endless resources. The 2018 F-250 will change this. According to For Construction Pros, the new F-250 defies half-ton conventions - delivering both strength and efficiency. Ford has partnered with renowned aftermarket tuner XL Hybrid to redefine the Super Duty platform. Beneath the hood now sits an electric drive system, which boasts a 1.8-kWh battery pack and a 259-volt traction motor. These elements work together to enhance economy, utilizing lithium-ion energy to bolster the truck’s performance. It directly fuses with the chassis, delivering a steady torque ratio of 220 lb.-ft (which demands fewer resources); and its regenerative braking functions maintain a smooth power-band. This ensures class-leading mileage - with the F-250 able to achieve a 25% overall output increase. Drivers can now experience up to 21 MPGs, allowing them to spend their time on the highway (rather than at the pump). To further impress, this system also reduces the truck’s carbon footprint - with its traction motor eliminating C02 emissions by more than 20%. This Super Duty model now proves both cost-effective and environmentally-friendly. Want to learn more? Visit our dealership today for further information about the optional electric drive system. The miles are dark; the moon is gone; and you squint at the road, trying to decipher straightaways from tight turns. This is no easy journey you’re undertaking, and the lack of light has left you overwhelmed. Ford suggests seeking LED aid. Front: Along the fascia discover LEDs embedded in the dual power mirrors. These will serve as puddle lamps, both expediting nighttime processes (locate the box-steps, Easy Fuel capless filter, and other exterior features with ease) and delivering safety (should a driver need to step outside of the F-150, these options will alert passing cars to its presence on the side of the road). Daytime running lights also increase visibility in low-level environments and lessen the chance of a collision. Rear: LED lights frame both the tailgate handle (to ensure drivers can easily locate it) and the cargo bed (with bulbs dotting the long line of the frame and showcasing the four tie-down hooks). A center-mounted stop-lamp further promotes maximum visibility and casts a wide-beam angle. This provides convenient illumination while working at night. The 2018 F-150 allows drivers to dominate the dark - providing LED protection with every mile. To learn more about these lighting systems contact our team today!